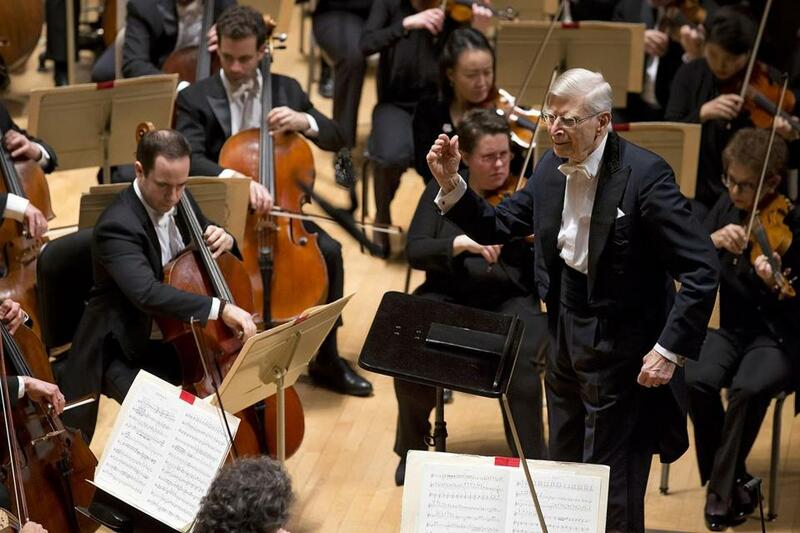 Conductor Herbert Blomstedt leads the BSO in Brahms’s Symphony No. 1 at Symphony Hall Thursday evening. The last time I saw the Boston Symphony Orchestra perform Brahms’s Symphony No. 1, Donald J. Trump was hours away from being elected president of the United States. Thursday evening, the BSO performed the same symphony for the first time since that November 2016 series. For concerts this week and next, the orchestra is offering complimentary tickets to federal employees who are furloughed or working without pay in the longest government shutdown in the nation’s history, an offering many orchestras around the country are also making. “We are trying to at least give them an hour and a half of hopeful pleasure in an ever-darkening world for them as this shutdown gets protracted,“ BSO president and CEO Mark Volpe told WBUR on Wednesday. With the seemingly tireless nonagenarian conductor Herbert Blomstedt on the podium, the program of Haydn and Brahms touched on the hopeful and pleasant, and then reached beyond. For Blomstedt, music is a profoundly spiritual practice. A devout Seventh-Day Adventist, he won’t rehearse on Saturdays but will perform, seeing performance as an expression of spiritual communion rather than work. Watching his economical gestures as he conducted the symphony from memory, I found myself thinking of the words of Mary Oliver, the Pulitzer Prize-winning former Provincetown resident who died Thursday morning: “Here you are, alive. Would you like to make a comment?” Like Oliver’s writing, Blomstedt’s leadership was undogmatic and eloquent in its simplicity. It seemed that in the symphony we were hearing not only Blomstedt’s comments on being alive, but perhaps Brahms’s as well. The symphony took Brahms decades to complete as he quailed under Beethoven’s long shadow. The two dense outer movements outline a journey of conflict, anticipation, and triumph, while the inner two can provide airier respite. Blomstedt and the orchestra showed that respite does not have to mean the absence of continuity with the dramatic arc of the piece. The second movement’s sound was dry, in tension with John Ferrillo’s consoling oboe solo, and a frantic pulse permeated the third movement; all these connected the inner movements to the larger story. The finale’s horn duets frankly glowed, as did the C major string melody that is among the symphonic literature’s most transcendent moments when done well, as it was here. The first half of the evening was taken up with Haydn’s Cello Concerto No. 1 in C, a relatively recent addition to the repertoire after the presumed-lost full score was discovered in Prague in the 1960s. Norwegian cellist Truls Mork’s interpretation of the solo had wonderfully vocalistic qualities, and his treatment of the melody itself seemed to breathe between phrases. (A former boy chorister, he has emphasized the link between the cello and voice in interviews.) The second movement was especially compelling in this regard, as were the gracefully unfurling solo passages. The third movement’s zigzagging runs sounded a bit clipped, but Mork’s encore was a treat; a languorously etched rendition of the Sarabande from Bach’s Suite No. 2 in D Minor. Walking out, another Mary Oliver poem came to mind: “The man who has many answers/ is often found/ in the theaters of information/ where he offers, graciously,/ his deep findings./ While the man who has only questions,/ to comfort himself, makes music.” In this moment, so many questions are unanswered. But always, there is music; no kind of solution, but a comfort.